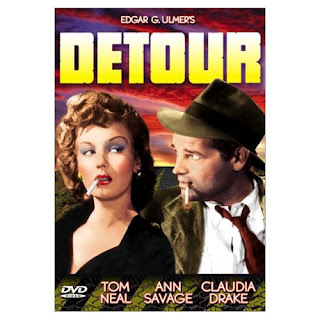 Edgar Ulmer's "Detour"(1945) is a gritty, low budget masterpiece of Film Noir. Filmed on a shoestring budget in only six days, the atmosphere of this movie breathes tension and paranoia The movie is about Al Roberts (masterfully played by Tom Neal) a piano player in a seedy New York dive who is hitchhiking to California to meet up with his girlfriend who left him to pursue a career in show business. A car eventually picks him up. The driver is a dark, mysterious person named Charles Haskell, Jr and he has deep scars on his hand from a hitchhiker he had picked up earlier. After some conversation and a meal, Al takes over the wheel so the driver can sleep. It starts to rain so Al stops and gets out to let up the top of the car. To his horror he realizes that the man who picked him up has died in his sleep. Panicking, Al does not know what to do. Surely the police will think he murdered the man for his car and money...that's the problem with being a hitchhiker. So he hides the body, takes the man's clothes, ID, and money and assumes the identity of Charles Haskell. That way no one will find out that the man is missing. "Wait a minute! ", you may say. "That makes no sense!" Well you have to be inside of Al Roberts' mind to understand, and this movie does a great job of doing just that. The character of Al Roberts is hopelessly doomed and fearful, with no desire to defy the hands of fate. And what an ending this movie has! I can't give it away...you have to see it for yourself. The narrative is told in a flashback as Al sits in a seedy diner that is enveloped in gloom. Like I said earlier, this movie oozes atmosphere and tension, and Ulmer uses this combined with a superb, knife-edged narrative to get inside the head of Al Roberts. It is amazing what Edgar Ulmer accomplished with such a small budget and little amount of time. This movie is dark and grainy, and the print is very rough around the edges, but it is worth every second of your time. I couldn't find a trailer, but you can watch the first ten minutes of the movie here.